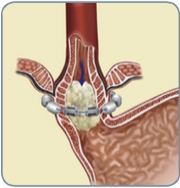 The LINX® Reflux Management System is the only available FDA-approved device to treat Gastroesophageal Reflux Disease (GERD), a debilitating disease that affects 1 in 5 adults. Millions of people suffering from GERD now have a new, safe and effective treatment alternative. 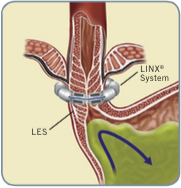 The LINX System is a small, flexible band of magnets enclosed in titanium beads. The magnetic attraction between the beads helps keep a weak esophageal sphincter closed to prevent reflux. The LINX System is implanted around the weak sphincter just above the stomach in a minimally invasive procedure that typically takes less than one hour. • LINX is the only available FDA-approved device for the treatment of GERD — An FDA advisory panel voted unanimously in favor of the LINX System’s safety, efficacy and clinical benefit. This positive vote was followed by FDA approval on March 22, 2012. • LINX study results appeared in New England Journal of Medicine — The 3 year results of a 5-year clinical study assessed 100 patients with chronic GERD before and after treatment with the LINX System. 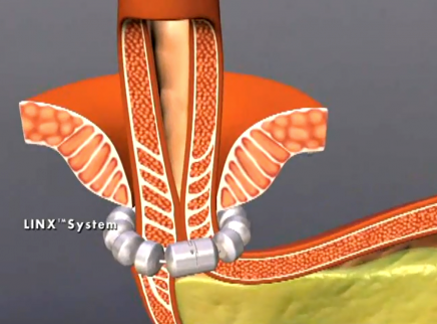 How It Works: LINX is designed to STOP REFLUX AT ITS SOURCE. LINX is implanted laparoscopically in a minimally invasive procedure that typically takes less than one hour. Patients generally go home within one day. in the stomach. They do not address the cause of GERD, a weak sphincter muscle, and can’t prevent reflux. Approximately 40 percent of GERD sufferers continue to have symptoms while taking medications for GERD. Current surgical treatments for GERD are performed annually on an estimated less than one-half of 1 percent of GERD sufferers in the U.S. The Dailymail wrote about LINX being the next generation in heartburn treatment. Please read the article here.